← How to stamp PDF with image? The desktop application VeryPDF PDF Stamp allows to stamp PDF document with text, image, graphic lines, rectangles, etc. 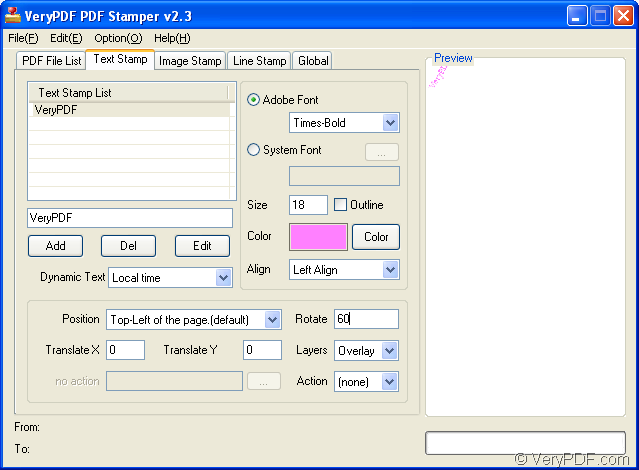 This article aims at showing you how to add stamp for PDF with text in the following contents. Please the homepage of VeryPDF PDF Stamp. Free download VeryPDF PDF Stamp. Via clicking the link above to download PDF Stamp to your computer, you are able to install the application on your computer by following the setup wizard. You are able to launch the application by clicking its icon or from start menu, or other ways. PDF Stamp supports drag and drop operations when adding PDF document into it. Or you can click Add PDF Files button to choose PDF from the popup window. In Text Stamp tab, there is a Text Stamp List used to list the added text stamp. Below the list, there is an edit box which can be used to input the text stamp according to users’ requirements. For example, edit VeryPDF in this edit box and then click Add button, the stamp will be successfully added in the list. The button Del is used to delete selected text stamp. You can also use the dynamic stamp offered in Dynamic Text dropdown list. On the right of the stamp list, you are able to set the text font, font size, font color, etc. parameters. In the group box below, you can set the location, rotation angle, link of the PDF stamp. On the right of this window you can see the preview of the added PDF stamp. Please see the process in next snapshot. Please click PDF File List tab again and click Stamping button to stamp the PDF document. In popup window, please choose output destination and input the file name for the stamped PDF. 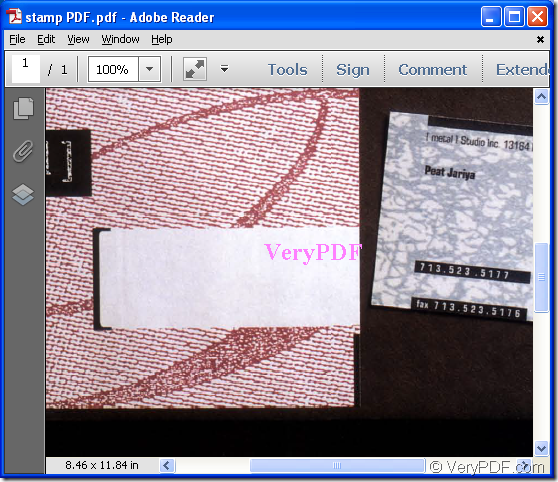 The next snapshot shows the stamped PDF document. When you click the button below, you are able to download free evaluation version of VeryPDF PDF Stamp. Just have a try and you will find that this is a powerful application.